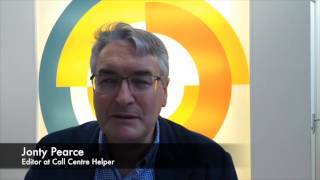 What barriers stand in the way of a dream contact centre? We catch up with Jonty Pearce, editor at Call Centre Helper magazine at the last Customer Contact Expo, who shared a few of his insights on the results of a survey run which asked 600+ contact centre professionals - What key barriers are preventing you from running your dream contact centre? As expected, budgetary issues came top of the list with 67% opting for this. However, the next three were all about technology with 44% dealing with IT complications, 40% highlighting the need for new technology and 35% claiming technology was not joining up. As Jonty prompts, these statistics were quite surprising. Although it is to be expected that technology would be one of the main key barriers in the way of a dream contact centre, these issues raced way ahead of typical ‘human factors’ well known in a contact centre environment, such as management buy in (28.1%) or not having enough staff (24.5%). There is no doubt that customer service has changed considerably in recent years, resulting in an increasing amount of pressure being placed on agents to handle difficult queries as well as being expected to master the art of digital channels such as webchat and twitter. The need to provide an Omni-Channel experience is now in more demand than ever, meeting the needs of the modern consumer who expect their mode of contact with organisations to be able to change depending on their situation. Whether this means they are at work, travelling, in a meeting or even abroad, it’s simple – the modern consumer is expecting the organisation they wish to contact to accommodate their needs regardless of where they may be and regardless of IT complications and technology not joining up in your contact centre. Ultimately, it is not a surprise that technology is one of the key barriers in preventing a dream contact centre. Contact centre professionals have recognised that before dealing with the human element of the dream contact centre, the relevant technology and systems must be in place and operating at an optimum level. As Jonty states “It is unfair to expect agents to deal with slow computer systems. While contact centres are beginning to wake up to the benefits of maintaining good computer systems, there is still some way to go before this becomes industry standard" (PR Newswire - New Research Reveals that IT Issues are Holding Back the Contact Centre Industry).